Jade plant is easily grown as a houseplant. Crassula ovata is a common houseplant that is usually called jade plant, or less frequently referred to as friendship plant, money plant, or silver dollar plant. Previously classified as C. argentea, C. portulaca and C. obliqua, it is still occasionally sold under these other, older (and incorrect) names. This species is just one of about 300 in a diverse genus, part of the orpine family (Crassulaceae), about half of which are native to southern Africa. The name crassula means thick or fat, referring to the fleshy nature of the genus, and ovata means egg-shaped, referring to the shape of the leaves of this species. C. ovata is a prominent component of valley thicket vegetation of the Eastern Cape and KwaZulu-Natal. The very similar C. arborescens, which has almost spherical blue-gray leaves with a distinct waxy bloom, is found in a different area, in the Little Karoo and Central Karoo. It has compact, rounded heads of pink flowers. The Khoi and other Africans used the roots for food, grated and cooked, eaten with thick milk. They also used the leaves for medicinal purposes. Jade plant is an easy-to-grow succulent that stores water in its leaves, stems, and roots. 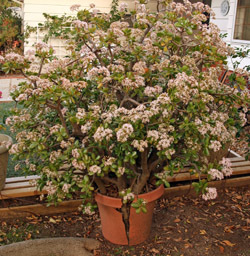 It has been used as an indoor ornamental throughout the world, and a landscape plant in mild climates. It makes a good houseplant as it grows well in the restricted root space of containers, is relatively slow-growing, likes the warm, dry conditions found in most homes, and tolerates neglect. In it native habitat, C. ovata grows into a small rounded evergreen shrub (to 6 feet) on dry, rocky hillsides. It has many short, thick, succulent branches on a gnarled-looking trunk, suggesting great age even in young specimens. The bark peels from the trunk in horizontal brownish strips on old plants. The smooth, rounded, glossy, egg-shaped leaves are about 1 to 3½ inches long and ¾ to 1½ inches wide, and are borne in opposite pairs, with each pair at right angles to the next pair. They tend to be clustered at the ends of the branches rather than spaced evenly along them. 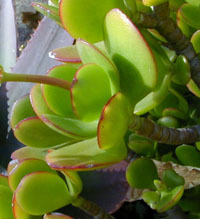 The green, fleshy leaves should be edged or tinged with red (the plant really should have been given the common name ruby plant) when grown with sufficient light. New stems are also green and very succulent, just like the leaves, but they become brown and woody as they mature. The lower leaves will slowly drop off naturally. 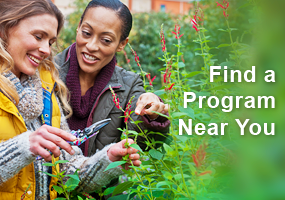 If the leaves get burnt – from sunburn, insecticide damage, or frost – the damaged leaves will die and fall off, but new leaves will sprout. Tight, rounded clusters of small white or pink, star-shaped flowers are produced in response to long nights. The flowers have a faint sweet scent and are attractive to bees, wasps, flies, beetles and butterflies. Under ideal conditions of bright light flower clusters can cover the plant in masses thick enough to hide the foliage. Under good conditions, pollinated flowers produce a small capsule filled with seed. To encourage bloom, water should be withheld and the plant should be held under cool conditions (around 55˚F), especially at night, in the fall. They should be kept in an area that will not receive any supplemental light so that the natural light cycle of the season will trigger flower initiation. Several weeks of cold, dry, dark treatment, followed by regular watering should result in flowering. 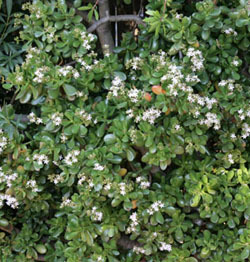 Jade plant produces clusters of small white or pink, star-shaped flowers. Jade plant does best with four or more hours of direct sun, but they will survive in bright, indirect light. Inadequate light will produce a plant with deep green leaves and drooping stems – there is nothing wrong with the plant other than it doesn’t have enough light to produce normal compact growth and reddish coloration. This plant is tolerant of a wide range of temperature and humidity, and may even tolerate light frost, but will be killed by freezing conditions. Houseplants can be moved outdoors for the summer, but need to be acclimated gradually to the higher light intensity outdoors to prevent sunburn. They must be brought indoors before the first frost. Plants can remain in containers for a long time, becoming root bound and top-heavy. These plants need well-drained soil, and do best in potting mixes without peat or other moisture-retentive components. Use topsoil mixed with perlite, sharp sand, pea gravel and/or chicken grit to create a planting mix that will drain quickly. Individual plants can be grown for many years while root-bound, although it is best to repot them every two to three years or when a plant becomes top-heavy and susceptible to tipping over. The best time to repot is as new growth starts. Prune the roots when re-potting into the same size pot and cut back the stems to maintain the shape and encourage development of a thick main trunk. Water sparingly until established in the new container. Foliage and flowers of jade plant. As with almost all succulents, they do best when the soil is allowed to dry out between deep waterings. 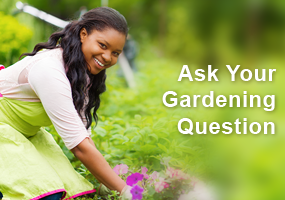 Plants can be watered liberally during active growth, in spring and summer, but should dry out slightly between waterings and should not be allowed to sit in water. In winter, when they are semi-dormant, watering should be restricted and the soil should remain on the dry side. Overwatering will cause the leaves to drop and the stem to rot. Even though they are succulent plants, they do need water; drought can result in dwarfing, foliage spotting, leaf drop and death. Jade plants can be fertilized every two months during active growth, or use a dilute fertilizer more frequently. Jade plants benefit from pruning to keep them compact and growing vigorously. This is best done in spring, cutting stems back to a lateral branch. Pruning encourages the trunk to develop to be able to support the weight of the heavy leaves and stems, and also encourages root growth. They can be pruned into miniature trees, and make an excellent choice for a succulent bonsai specimen or a wonderful sculptural plant. The cuts will heal over in a few days and new growth will sprout within a few weeks. 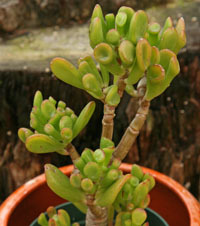 Jade plant is especially easy to propagate from stem or leaf cuttings. In the wild or when planted outdoors in mild climates, leaves or pieces of plant that break off and fall to the ground will root in a few weeks. When taking cuttings, it is best to allow the pieces to dry for a few days so the cut surface will be healed over and less likely to rot. Inserting the cut end into fairly dry, well-drained soil will speed rooting, although they will produce roots even out of soil. 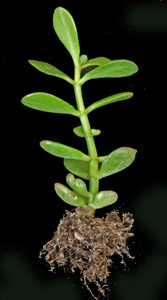 Cuttings root most easily in summer, but jade plant can be propagated at any time of the year. This plant can also be grown from seeds sown in spring or summer. This plant has few pests, but mealybugs are the most common insect pest. Infestations of the white, fluffy insects can deform new growth. The insects can be wiped off with a cotton swab dipped in rubbing alcohol, but the plants need to be cleaned frequently for several days or weeks until all of the pests have been eliminated. Use caution with insecticides, as there can be problems with phytotoxicity on the succulent leaves. Spider mites can also occasionally infest jade plants. There are a number of named cultivars of C. ovata, although these may not be readily available in all areas. ‘Bronze Beauty’ has small coppery green leaves on extremely slow-growing stems. 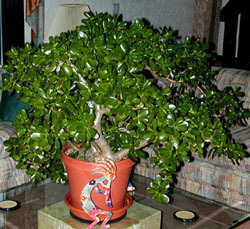 A jade plant with tubular leaves. ‘California Red Tip’ has purplish red edged leaves when grown in bright light to full sun. ‘Gollum’ has leaves that are nearly tubular, with a reddish tint, and look as though the end is a suction cup. ‘Hobbit’ has tubular looking leaves with reddish ends and dense foliage. ‘Sunset’ has green leaves streaked with cream/white and pinkish red. ‘Tricolor’ is a chimeral variety with creamy white-and rose-striped pointed leaves and pink and white flowers. Very interesting article. I love succulents and have several indoor and outdoor succulents! I had a beautiful Jade plant for years at work until one day it ‘melted’ (can’t describe it any other way). I fear it may have succumb to over-watering by an ‘Office Good Samaritan’. After that I had to make “please don’t water me” plant sticks for the rest of my desk plants. This has inspired the purchase of other one! I have never had great luck with succulents; probably due to either total neglect or too much fussing. I have picked up a few plants via our MGV meetings and have them in my bathroom for the moisture factor. Hoping to keep these alive through 2019! I’ve seen some excellent mature specimens of jades at the Mitchell Park Domes (desert dome) in Milwaukee. They do have a sweet smelling blossom. I have never been able to get less mature plants to bloom and have lost a few to rot–sometimes due to rain when taken outside for the summer. I love their “stately” look. 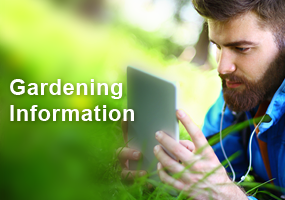 Thank you for the great information on propagating, flowering, and care. It is great to have such detailed information. 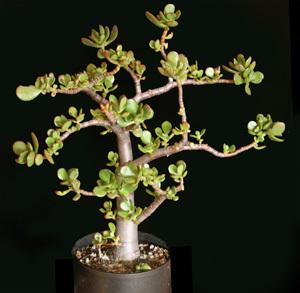 Are there further resources available on repotting and pruning jades? Love my jade plant, but has never flowered. This article has provided some good insights. I had an older friend who was moving into a nursing home and gave me her plant that was 60 yrs old. I had it for another 20 years when it got bugs and to much water and rotted. While it was in my care it never bloomed. I wanted to put it outdoors but was just to heavy to move. I have to admit I mourned that plant and the memories of my elder friend who died the same year. I wish it would have bloomed it would have been a great send off to both. I have a very old jade plant; almost 40 years old. I would like to give it a “boost” to see if it would flower or put out more leaves to make it look fuller. I may try some of the suggestions to see if that “oldie but goody” might respond. Unfortunately I can’t put it outside. The squirrels almost ruined the whole plant several years back. However, it just wasn’t ready to give up. They are very tough plants. I really like that fact that I have a plant that is that old! I have always admired the “Jade” plants. I can’t have house plants, small house with a huge yard. Interesting article, good to know if anyone has questions. I am excited to learn how to get my Jade plant to bloom. I might also try some bonsai techniques with the information provided. Thanks for the great article. Great article. I am so in love with succulents. I am going to try to form 1 into a bonsai plant. Lots of new helpful information for me. I had no idea the jade plant was from Africa and has 300 species including one the Khoi/Africans use the roots as a source of food. Was curious what the leaves were used for medicinally so looked into and discovered it is to treat epilepsy, corns and as a purgative or for diarrhea. I’ve also never seen a jade plant in bloom, but it was interesting to learn that it blooms under similar conditions to that of a Christmas cactus. I have been getting more and more interested in growing succulents during the past 3 years. Two wonderful resources I have found are anything by Cassie Tuttle, including her Idiot’s Guide Book on Succulents and blogs/mailing lists and Bonsai Jack for the best draining succulent soil around as well as Manure Tea fertilizer. The soil is pricey, so I usually mix it with some of the less expensive succulent/cacti soil available locally from Miracle Grow. bonsais. the first site i have come across with so much info. Thanks very much for a very interesting article. I found it very useful with a lot of new information to me. I have never seen them in the wild and now I would like to see various forms in nature. I enjoyed this article. I was unaware that jade plants flowered .